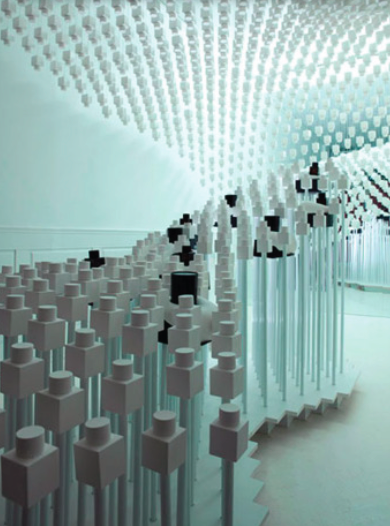 Odin New York, the beloved East Village men’s boutique, has teamed up with Snarkitecture, a collaborative design practice that blurs the line between art and architecture (and snark), to create a very different kind of pop-up shop that focuses on the retailer’s award-winning unisex fragrances. The Brooklyn-based design team began with Odin’s minimal black bottle and flipped it by producing allwhite plaster replicas. Snaking throughout the store and up onto the ceiling, the eye-catching, high-contrast installation allows for a fully immersive scent experience. Beginning May 1, the shop will run for six weeks, but we’d suggest heading there ASAP. The first 50 people to make a fragrance purchase in week one will receive a plaster bottle, and next week, an Odin and Snarkitecture tote. If only a trip to the MoMA came with parting gifts.